So Spring is here and our croft at Sunhill is full of bouncing little Hebridean black lambs. The last few weeks have been extremely busy with lambing, the start of a new season for Lamraig cottage and Ocean Guides not to mention of course a very successful Edinburgh Yarn Festival MAKE: WOOL event - thank you Mica and Jo. Since returning from Iceland at the end of February, I have not had time until now to reflect on all the experiences and creative stimulation of my art residency at the Icelandic Textile Centre in Blönduós, Northern Iceland. The purpose of the art residency was to bring together the two strands of my creativity: The Birlinn Yarn Company (knitting and life as a crofter/shepherdess) and my visual arts practice. I was also keen to learn about the shared heritage of Hebridean and Icelandic sheep and farming in this extreme Northern environment. Exploring the history of the migration of the Norwegian Vikings and hence the North Atlantic sheep, a breed that includes both Hebridean and Icelandic, was also a motivation. What surprised me during my residency was discovering the strength of the link between Iceland and the Hebrides. Icelanders refer to the Hebrides as ‘suður eyja’ the Southern Isles. In the Icelandic Book of Settlement ‘Landnámabók’, Shetland is referenced twice, the Faroes three times, Orkney seven times but the Hebrides are mentioned twenty-two times. Many of the early settlement areas share place names with the Hebrides such as Hekla, Grimsay, Pabbay and Barra. There are in fact several places in Iceland named after our island of Berneray, which I discovered very definitely refers to Bjorn’s island, rather than Bear island as it has sometimes been known, which was a good point to clarify. Further to this, through genetic studies it has now been concluded that 80% of the settling males in Iceland were from Norway whereas 62% of the settling females were Celtic or Hebridean. However, to further strengthen the case for links with the Hebrides, it has been discovered that there are two kinds of mitochondrial DNA that are unique to only Icelanders and Hebrideans. So it seems that the link between Iceland and the Hebrides is much more than sheep!! The Laxdaele Saga, the story of Aud the Deep Minded and her family, is a romping Norse tale of war waging, love and bravery. Aud the Deep Minded is recognised as being the first and possibly only woman to establish a settlement in Iceland in her own right in 895 AD. She was born to Ketill Flatnose a mighty and high born ‘hersir’ chieftain in Norway. However, the rise of the domineering King Harald of Norway meant powerful families had to either give up their lands to the King, be chopped into pieces or flee. Ketill Flatnose chose the later and fled to Ireland where Aud married Olaf the White, the self-appointed Norse King of Dublin. Olaf was a hot headed warrior who, after the birth of their son, was killed in battle. Aud then fled to the Hebrides where, in due course, her son Thorstein married and had a family of seven children. They were settled there for some time until Thorstein, who had taken to warring far and wide in Scotland, was killed by his own men. Aud was at this time in Caithness, she then commissioned a ‘knarr’ a Viking ocean going boat to be built in secret in the woods. On its completion, she gathered all her remaining kinsfolk and men of high status as well as several slaves and set sail, with herself as captain, first to Orkney, then Faroes (marrying off her grand daughters en-route) and finally arrived in Iceland to claim settlement lands in the Broadfirth-Dales in 895 AD. In due course, she divided up her land amongst her people and announced her slaves free men of Iceland. For so many reasons this is a great saga of Norse history, the migration of their people and a powerful, intelligent female leader. It also further demonstrates the strong links between Iceland, Scotland, Hebrides and Ireland. The view from the Icelandic Textile Centre in Blönduós. And so to Blönduós and the Icelandic Textile Centre. I spent three weeks in Iceland of which two weeks were spent at the Textile Centre, which was a little too short but such is life. The accommodation at the Centre is simple and comfortable. The village has a open air geothermal swimming pool which was a great bonus, supermarket, booze shop and a couple of café/restaurants so not a metropolis but this meant there were no great distractions and we all just got down to work. My fellow artists were great company - industrious, international and mutually supportive so a very positive experience. 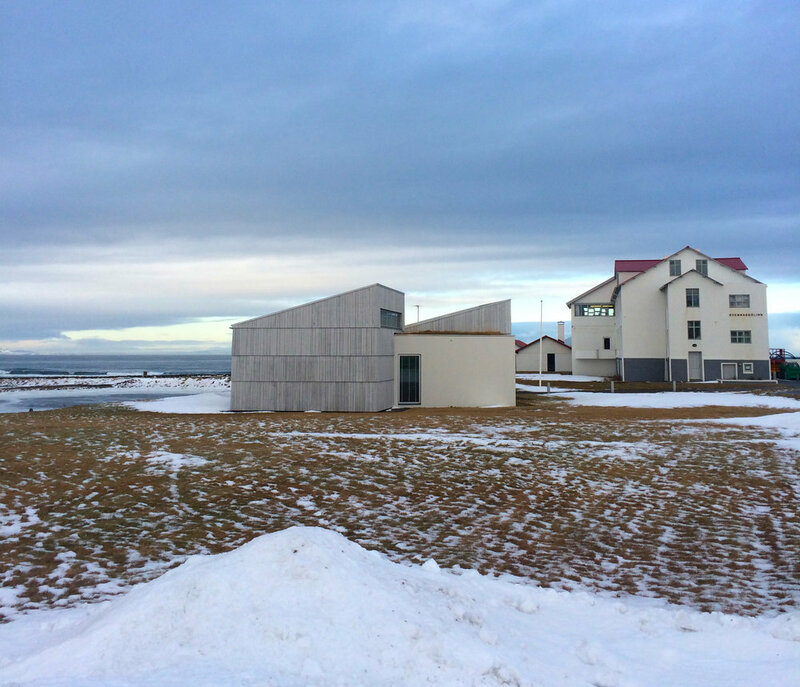 Icelandic Textile Museum (left) and Textile Centre (right), Blönduós. The Centre provides space and facilities but no tuition, though there is a weaving tutor every 2 weeks. There is a large felting studio with additional work tables, a weaving studio, dyeing room and digital weaving studio. Next door to the Textile Centre is the Textile Museum housing a fascinating archive of woven, knitted, felted and embroidered items and garments from all over Iceland. While at the Textile Centre, I focused on exploring the qualities that are specific to North Atlantic sheep fleece. These fleeces have two layers: an outer layer ‘tog’ with fibres 8-12cm long and an inner layer ‘thel’ which is short and fluffy. This is a characteristic shared with both Icelandic and Hebridean fleeces so it was very relevant research. Istex, the main wool processor in Iceland, have their wool wash facility in Blönduós. All the fleeces from across Iceland are gathered at this point. Istex generously supplied fleece to the artists for creative purpose for which we were very grateful. The resulting art works explored the different qualities of these fibres through knitting, felting and binding. They also responded to the cultural heritage of wool work dating back to the Vikings and more recent times. The Vikings wove the long outer layer ‘tog’ wool fibres into what was called ‘roagvalfeldur’. This was then worn as a furry cloak that, due to the water shedding properties of the ‘tog’ fibres, was both weather resistant and warm. This fabric was so valuable that it was used as a trading pile from 850 AD until around 1350 AD in exchange for other goods. Fellow artist in residency Aya Tsukui learning to weave a ‘roagvalfeldur’. On location in Iceland wearing my Roagvalfeldur cowl. Instead of weaving, I experimented with knitting these long fibres into a cowl. The result was quite successful and I plan to knit the long fibres of our Hebridean sheep into a similar cowl though in black Hebridean fleece to contrast the white Icelandic fleece. Part of the aim of this visit to Iceland was to discover the history and potential genetic links between Hebridean and Icelandic sheep. I decided to represent the genetic variation through exploring the different colours of North Atlantic sheep, which range from black through various greys and light browns to pure white. I did so by felting the under fleece fibres ‘thel’ into hollow sausages which were then snipped into ‘polo-mint’ shapes. By laying them out flat a picture begins to build of the huge range in fleece fibre colour. This is still a work in progress as my aspiration is to collect as many fleece colours as possible from all the North Atlantic sheep. ‘Pradaleggur’ wrapped with tapestry threads. On my visits to the sheep farms I was presented with a ‘pradaleggur’, often referred to as being made by the farmer’s mother or grandmother. A ‘pradaleggur’ is a sheep thigh bone scrapped clean and sometimes coloured, around which was meticulously wrapped tapestry threads as a means of keeping them. The resulting thread patterns were very beautiful and the women took great pride in the process of carefully wrapping them. Icelanders have been historically resourceful with nothing going to waste, hence why they use the bones as a useful object. In our culture, we have become quite bone adverse and I was interested in the beautiful patterning of the tapestry threads contrasting the material quality of bone. I was kindly lent several sheep skulls by local farmers for my research. I explored the potential of the ‘pradaleggur’ by wrapping weaving yarn around the horns and skull bones. By combining different coloured threads this produced interesting patterns which for me were reminiscent of Harris tweed. At the end of my residency, I returned the skulls but some farmers were very happy to receive them back with their horns wrapped with threads. During my time in Iceland, thanks to the generosity and welcoming nature of Icelanders, I also spent time on several sheep farms. However, to do this justice I will write this into my next blog and will include a discussion on Icelandic Leader sheep. In the meantime, I would like to thank all the staff at the Icelandic Textile Centre for making us so very welcome and for all their help and advice during our stay. The art residency was everything I could have hoped it would be and I would thoroughly recommend it if you get the opportunity. I am also very grateful to Comhairle nan Eilean Siar and Creative Scotland for the Visual Arts and Craft Makers Award that I received which made this wonderful experience possible.